Right from the start Synetic puts their signature wordless stamp on a play most of us know well. The fairies are powerful, pagan and exotic. In a perfect twist on the plot, Puck becomes the orphan that Titania and Oberon fight over, instead of it being some nameless child, and that battle is a glorious dangerous display of both the physical and the magical. The thwarted young lovers are discovered drinking away their sorrows with a bottle of Jack. They go from sadly tipsy to athletically audacious on a dime – there are some frighteningly daredevil toss-and-catch fights. The goofy “rude mechanicals” are a hodge-podge of leather and denim. There’s even a delightful nod to the Marx Brothers with a pianist in a Chico hat (and was that a riff from “A Night at the Opera” maybe? brilliant job as always by composer Konstantine Lortkipanidze). Not to mention a hilarious parody of Synetic’s past Shakespeare productions. You have to love a company that can make fun of itself. Anastasia R. Simes outdoes herself again with the production design. Titania becomes a sort of Indian Xena Warrior Princess, and the forest is austerely pagan. My only quibble – the gold Isis wings for the fairies. I prefer my fairies a bit more naughty, less pretty, but the wings did accent their movement. Andrew Griffin’s lighting is nothing short of magical and mysterious, without being obvious. And of course, the seamless interaction between the direction of Paata Tsikurishvili and choreographer Irina Tsikurishvili is an inspiration. It always seems unfair to highlight specific actors in a Synetic production, because they are the essence of a true ensemble, but after seeing Irina Tsikurishvili’s Titania I cannot wait to see her Cleopatra. Irakli Kavsadze makes Bottom’s transformation a thing of horror that suddenly becomes hysterically funny. 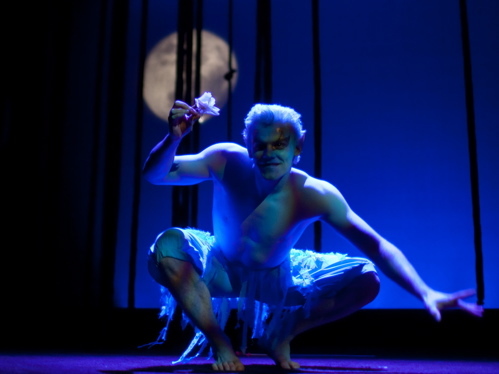 And Alex Mills’ Puck is a wicked little tormentor, pulling the audience into his tricks with a complicit grin. Tickets are already starting to go, so get yours asap. You will not regret it. Oh wait, what did I mean by “her Cleopatra”?? Yes, the next wordless Shakespeare Synetic will tackle is “Antony and Cleopatra,” to be performed at Shakespeare Theater’s Lansburgh in January 2010. Before that, they will reprise their hot-and-heavy “Dracula” this fall at the Rossyln Spectrum.